I should be working right now…I have so many things to finish it isn’t even funny, but it has been a long day. A day that started at 5:30 this morning, and after working 12 hours and almost a 2 hour commute home, I am pretty much done. I have been on edge for a while now, and there could be many reasons to explain it, but I think I finally figured it out. Today’s rain was definitely a sign. When I was delivering my first baby, there was a joy that I can’t explain that came over me when the doctor told me I had a girl. It was not that I didn’t want a boy, but for some reason I was less afraid of having a girl. My husband was convinced that our second child was a boy, but deep down inside, I knew it was another girl. That same joy consumed me when I heard those same words after she came out of me. Even though my sister and I are not close, I was thrilled to have two girls – sisters – even with all the drama that comes with it. I have always cherished the fact that I have two girls. They love to cook and bake with me, they love to go shopping, get their nails done – and don’t get me wrong – they can fish, play softball and other fun stuff with their Dad (and boy do they love their Dad), but we have a special bond as well. I am the Mommy, they tell me things first – and they hold nothing back. I am sure there will be a time when that will change, but let’s hope not, and until then – I will savor every minute. Unfortunately my story is not the way it always is for mothers and daughters. You hear about the struggles that mothers and daughters have – sometimes you even get a glimpse of the pain. It is not fun to watch. I want to be involved in every happy moment that my children have – and I am pretty optimistic that I will be able to do so. I am a very lucky Mommy. It is only fitting that I post these delectable goodies – this was a team effort – I made the crust, and my daughter and mother made the caramel and topping. My daughter wanted to make it all by herself, but I asked my mother to supervise – and it didn’t take long though before they both had their sleeves rolled up and were knee-deep in the caramel making. It was really fun to watch. These were hands down ridiculously delicious. Crisp on the bottom, chewy in the middle, and rich on top. Thanks Tracey’s Culinary Adventures adapted from Annie’s Eats (originally from Baked and The Golden Book of Baking) – for a great afternoon, and a perfect finished product – with my mother and my daughter. It’s funny – I had always pictured myself as a mom of three boys. I didn’t really want a girl based on the challenges my mom and I had (fortunately we are close now). Then when I was pregnant with Miss A I just knew it was a girl and I couldn’t be more thrilled. You’re right – there is just something about being the mom of a girl (and a boy too). I love it. And it is such a joy to see your own mom with them too. It’s a hard feeling to describe. Your caramel treats are certainly something both my mom and Miss A would enjoy. Here’s to Friday!!! Three boys would be quite a handful! My neighbor has four boys, and I don’t know how she does it! Showed this recipe to Lindsey and she is going to make them for me…they look delicious. Love having girls too! That’s awesome!! Lisa, that is definitely not going to happen – thank goodness for the Connector, and that I was actually productive on my way home!! This is such a sweet thought of you, your mom, and daughter all squashed into a salted caramel bar! :) No really, what a tender post. We for sure get what in life what is best for us! I’m glad you have your girls and they will love sisters! I would die without my sisters! Thanks Liz – I hope the party is going well!! Those look so good! 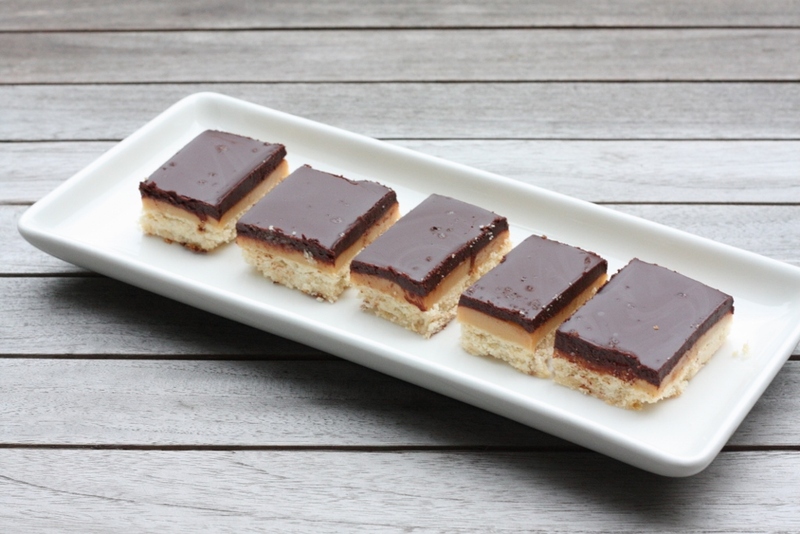 I once tried a recipe like this called millionaire shortbread bars, but I didnt love the taste of powdered sugar in the shortbread. I’ll have to try this one- and I love the sea salt too…salty+ sweet is the best! Yes, these were incredible…not powdered sugar taste at all!! Our local market has something similar with shortbread, chocolate and caramel which my two girls are very fond of ( and me of course ) so we decided that I was going to have a go. Your recipe was ten times better , I wasn’t sure about the salt so we made some with and some without . The kids soon cleared the lot ! I loved your commentary about mothers and daughters, i’ve had two that are so different, but thankfully we all get on just fine.